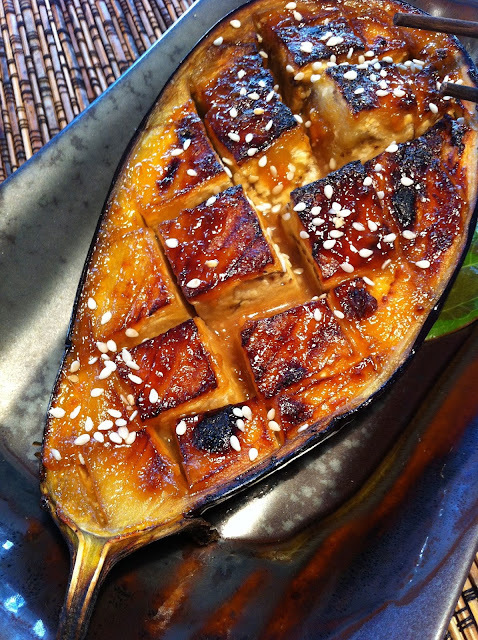 We know it's not that long ago we were extolling the virtues of the humble griddled aubergine but make no apology for mentioning it again as this dish is really special. It is a favourite whenever we go to Japanese restaurants but to be frank it always seems such poor value that last time we ordered it a few days ago at Eat Tokyo just off Leicester Square we resolved on the spot to get the ingredients and make it ourselves. Over lunch Ghaz surfed the world wide web on his iphone and we picked up the ingredients we didn't already have in Chinatown on the way home! It's actually very simple to make. The only sightly tricky ingredient is the miso paste of which there are two varieties, red and white. We plumbed for the red simply because the resultant colour is more appealing. (We have yet to try the white in the same recipe). We have put in a link below which explains the nature of the ingredient. The paste totally transforms the taste of the aubergine flesh so even if the humble egg plant is not one of your particular favourites we think you will really enjoy this as a wonderful vegetarian starter or side to accompany fish dishes in particular! Pre-heat grill. Cut the aubergine lengthwise leaving the stalk on. Score the flesh diagonally taking care not to pierce the skin. Brush the halves all over with vegetable oil and place under the grill flesh side up for a few minutes until browned then turn over for a few more minutes until you are happy the flesh is soft and cooked. Remove from the grill and pat dry. Meanwhile in a separate pan mix all the paste ingredients and simmer until the mixture thickens to a syrup. Spoon over the aubergine flesh and grill for a further two minutes until the syrup has caramelised. Sprinkle with sesame seeds and serve immediately.